Mathieu Perreault will never garner the big headlines on a Winnipeg Jets team with stars like Mark Scheifele and Patrik Laine. It’s a shame, really, because the underrated veteran likely deserves them. There ought to be a picture of Perreault beside the phrase “possession driver”. His advanced stats are off the charts. He makes any line instantly better. Even fourth-liner Matt Hendricks found some success on his line. As for offense, sure, Perreault wasn’t himself in the playoffs with just one goal in nine games. In the regular season, however, he was his usual dependable self for most of the year with 39 points in 70 games. Tough decisions are ahead for the Jets, however, as their salary cap crunch is ever more pressing. With RFAs galore to re-sign and limited space in which to do so, a number of veterans are on the salary chopping block according to fans and pundits. 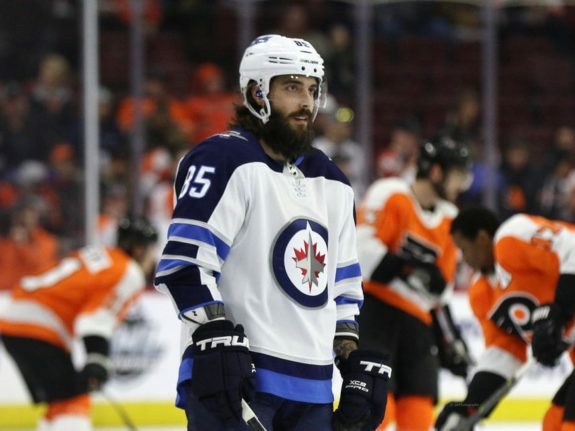 Recently, Elliotte Friedman speculated Perreault may be the odd man out in Winnipeg. It’s not hard to follow Friedman’s logic. Perreault is 30 years old and carries a cap hit of just over $4 million. While Friedman’s conclusion is no great intellectual leap, Perreault is the wrong man to drop the axe on in the name of the cap. While he’d likely fetch a solid return, there’s a reason the Jets are demonstrably better with him in the lineup. It’s tempting to look at the talent Perreault plays with and dismiss his success as a result of playing on a good team. The problem is, Perreault is excellent with lesser players as well. Even when the Jets were bad, he was usually good. By far the most offensively productive stretch of Joel Armia’s career, for example, came on Perreault’s line. He has a way of bringing out the best in players, to the point where he was the go-to fix at times, even during the playoffs. The Jets will need that as they shape up to be even younger up front next year. Good rookies have cracked the Jets roster every year. Next year will be no exception. We’ve advocated before for the Jets keeping Paul Stastny but even if they do, they’ll be younger next year. Toby Enstrom is gone. We know that for certain now. Sami Niku is his likely replacement. Up front, Jack Roslovic seems all but assured of a spot. Then there’s Kristian Vesalainen. The Finnish sniper burned through the SM Liiga at an incredible clip last year, almost unprecedented for a 19-year-old in fact. He’ll be a Jet next year. Players like Roslovic and Vesalainen have talent, unquestionably. They don’t have experience. There will be hiccups and speedbumps. The presence of veterans like Perreault, and Stastny for that matter, will limit and offset those bumps. Plug Perreault anywhere in the lineup and good things happen. Hendricks, Armia, and Laine have all found success with the man the Jets have affectionately dubbed Frenchy. The thought of him with the big, skilled sniper Vesalainen is an intimidating one. The Jets will not be able to keep the band together forever. That’s an unfortunate fact of life in today’s NHL. As the Chicago Blackhawks learned before them, the Jets are learning success has its price. The difference is the Jets haven’t had the same type of success yet. Chicago won Stanley Cups before jettisoning their pricey vets. Next year is the Jets’ year to chase a Stanley Cup of their own, and Perreault deserves to be part of that. There are things about Perreault that make him a tempting target for a salary dump. He’s never scored more than 18 goals in an NHL season. His injury history is troubling as he hasn’t played a full season in his entire NHL career. Perreault is 30 years old and making $4.125 million for the next three years. Anyone in a similar situation is going to be considered potential trade bait. Goodness knows he’d fetch a better price than Dmitry Kulikov and likely even Tyler Myers. However, when the time comes to shed salary, Perreault should be the last man the Jets look at. At least for this year. If something changes drastically in the next season, then perhaps trading Perreault is worth exploring. As of now, however, the Jets are suddenly in the midst of their prime years. You can thank Perreault for that, at least in part. When the Jets gear up to pursue the Stanley Cup in earnest next April, they’ll be glad they’ve got Perreault on board. Once they’ve gone for it with all their might, then they can look at trimming salary in Perreault’s corner. But only then.